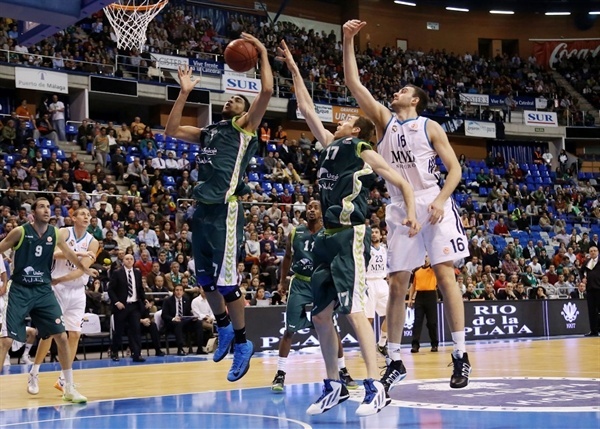 Real Madrid rallied from a 14-point deficit to down Unicaja Malaga 64-72 and stay unbeaten in the Top 16. Madrid improved to 4-0 to keep a share of first place in Group E with CSKA Moscow, while Unicaja dropped to 1-3 and sits in fifth place. 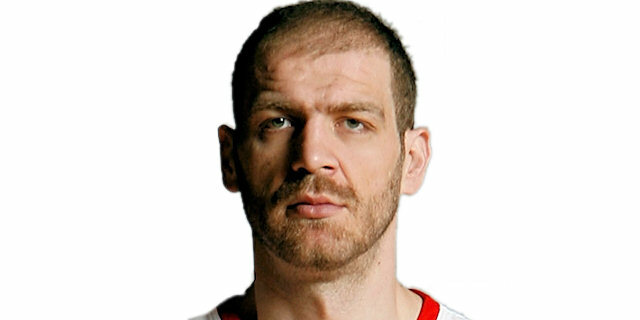 The hosts had the game in control when Krunoslav Simon scored 8 quick points at the start of the third quarter and grabbed a 46-32 advantage. But Real Madrid started a comeback with triples by Nikola Mirotic and Rudy Fernandez before Sergio Rodriguez scored 12 points in the fourth quarter, including a pair of triples that put the visitors up for good. Fernandez finished with 15 points and Rodriguez with 14 in victory. Jaycee Carroll scored all 9 of his points in the final seven minutes and Sergio Llull chipped in with 8 points plus 5 assists. 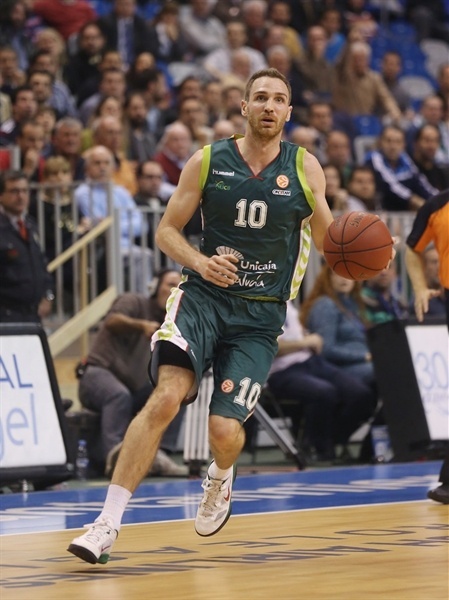 Simon led Unicaja with 16 points, shooting 4 for 6 from downtown. 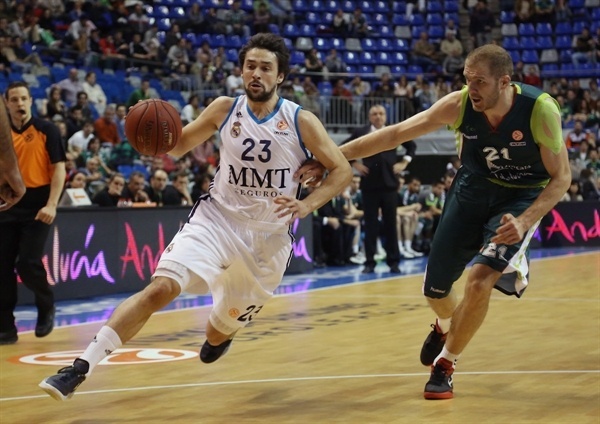 Fran Vazquez added 12, while Luka Zoric and Andy Panko each had 10 in defeat. Fernandez and Llull hit back-to-back triples for Real Madrid to open the game, before Simon hit one for the hosts, and Zoric used a lovely spin move inside to make it 5-6. Madrid answered with Llull and Fernandez hooking-up for an alley-oop dunk, but other than these flashy moves, both teams needed a few minutes to get into their offensive groove. Things picked up after Llull and Earl Calloway traded layins, and Carlos Suarez hit a triple for 9-15. It did not take long for Unicaja to catch up, as Vazquez and Sergi Vidal each made a pair of foul shots, and Simon hit another three-pointer, but Martynas Pocius made a layup and beat the buzzer on a long jumper to make it 16-19 after the first quarter. Augusto Cesar Lima, Vazquez and Marcus Williams all hit jumpers at the start of the second quarter to give Unicaja the lead, 22-19, but Felipe Reyes and Fernandez answered with layups for the visitors to regain a slim advantage. Madrid scored another alley-oop dunk, this time from Fernandez to Marcus Slaughter, but Unicaja went on a spurt starting with a fastbreak layup from Williams. Panko and Zoric followed up with jump shots before a three-pointer from Txemi Urtasun forced the visitors to call a timeout. Panko’s triple capped a run of 10 unanswered points, giving the hosts a 34-25 lead. 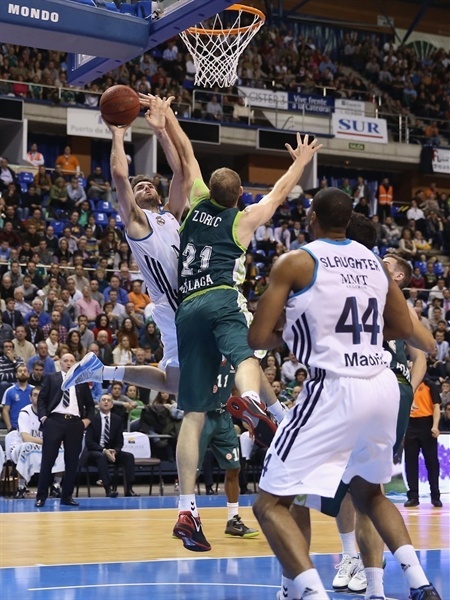 Fernandez made a layup-plus-foul before the end of the quarter, but Unicaja kept a 36-30 halftime lead. 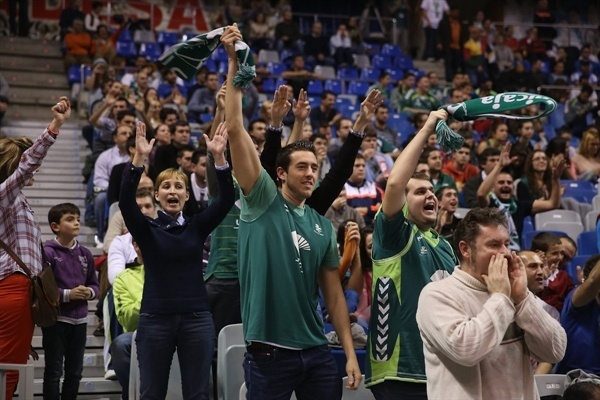 Simon hit a triple to open the third quarter and start another Unicaja run. After a Zoric dunk, Simon hit a jumper and a triple on back-to-back possessions for 46-32, a 10-2 run in little over two minutes. Mirotic answered with a three-pointer from the left corner for Madrid’s first field goal of the quarter, and after Zoric scored inside, Fernandez hit a triple and added a layup for 48-40. Slaughter’s alley-oop dunk cut it to 5 points, but Vazquez made a dunk to give Unicaja 50-43 lead after three quarters. Rodriguez nailed a shot from downtown to open scoring in the fourth quarter. Rodriguez then found Dontaye Draper for a wide-open three, and then hit a floater for 50-51. Carroll extended the lead with a jumper and a fade-away triple for 52-56. Unicaja’s scoring in the first six minutes of the quarter boiled down to 4 free throws from Vazquez, while Rodriguez hit another floater and an off-balance three-pointer for 54-61. Calloway ended the hosts’ field goal drought with a jumper, and Panko’s layup halved the deficit, but Llull hit a triple extending the lead to 58-64, and another floater from Rodriguez made it 61-68 inside the last two minutes. After a basket from Zoric, Carroll hit a runner keep the margin at 7 points, and the visitors sealed the deal with couple of offensive rebounds before a layup from Reyes rounded out the scoring. "First of all, I want to thank our fans for supporting the team in the tough moment that we are going through. We played really well in the opening three quarters, both on offense and defense. 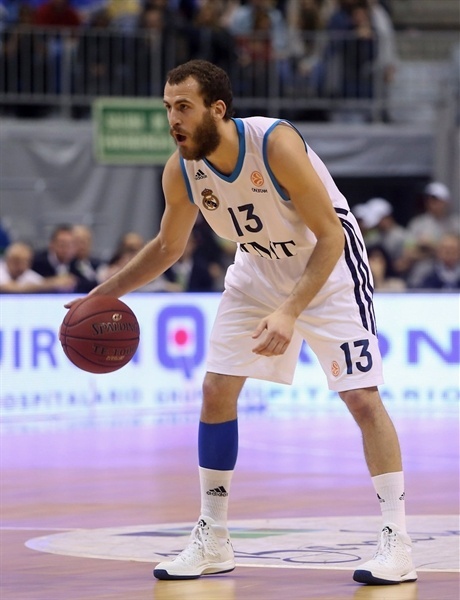 Real Madrid managed to return to the game by hitting several three-pointers. I can only complain about leaving Jaycee Carroll open when we had three team fouls. 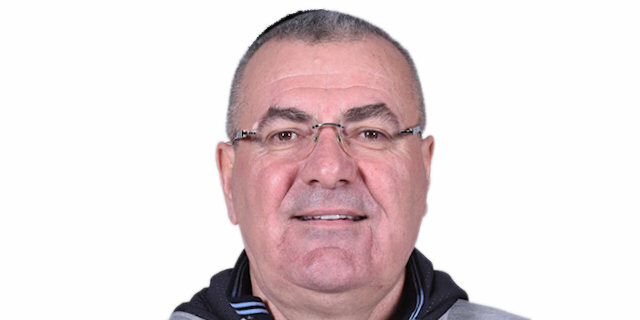 I have to congratulate my players for trying to win the game, but Madrid was the better team in the fourth quarter. We have to be positive because we have another game on Sunday. We will all try to win it together. I know it is not easy. I had never gone through a six-game losing streak. The way to overcome it is to have good spirit and stay even-tempered." "I want to congratulate my team for the win in a game that we knew it was going to be very difficult. 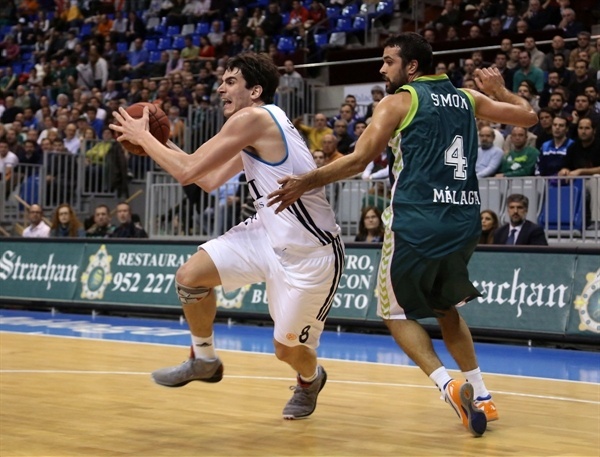 We started the game with good shooting percentages, but Unicaja improved its defense. We realized that we have to improve our defense in the second half and managed to do it. We worked well against their zone defense by being patient, playing inside-outside game and finding good shots down the stretch." "We have to work hard and we have a good team to do it. It's a shame; we played a good game, with good defense, but they overcame us in the fourth quarter. We have to keep trying because wins will arrive. Real Madrid is a great team and we have to play great defense if we want to beat them. We hope to play our game from now on, starting this Sunday, and get back on the winning track."